In September 14th, 1607 Hugh O’Neill, Earl of Tyrone, and Rory O’Donnell, Earl of Tyrconnell left Ireland’s shores for good. 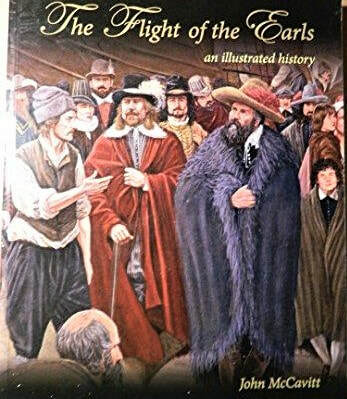 The event is commonly known as The Flight of the Earls and those who took part in the flight became known as the “Noble Ninety-Nine.” According to McCavitt in The Flight of the Earls, this event began the “lost leader syndrome” in Irish history. Two hundred and forty years later, another ‘lost leader’ would die in Geneva on his way to Rome, the final address, incidentally, of O’Neill and O’Donnell. Neither the Earls nor the King of the Beggars would set foot in Ireland again, but they could not have known this when they embarked on their journeys. In 2005, two years short of the four hundredth anniversary of the flight, John Hume remarked in an article in the Donegal Democrat newspaper, “Ireland is only now coming to terms with the changes and the division introduced in the aftermath of the Flight of the Earls.” But was this pivotal moment in Irish history a perilous flight to safety or a selfish abandonment of responsibility by the two big players – the Earls of Tyrone and Tyrconnell? Not only is the Flight of the Earls a key event in Irish history; it has also gone into the general lexicon as a phrase to describe fleeing for one’s safety following a failed mission, although this may not be the correct historical interpretation. Notwithstanding, it is an event that has earned more than its fair share of brownie points, along with the Wild Geese, when it comes to the romanticising of history. One Sunday morning in the late 1960’s as I and my three siblings went for a walk around Dublin Castle, my father drew our attention to a particularly high and imposing wall and told us with certainty that this was the very wall over which Red Hugh O’Donnell escaped from the English. I was yet to learn about this doughty earl, but already the seeds of romantic interpretations of Irish history were sown. My father was the same raconteur who told us that pilots dropped boxes of Cadbury’s Milk Tray to the soldiers in the trenches of World War One. It would seem then that we learnt from the master, because not many years later, we would proudly point to splashes of red paint on one of the follies in the grounds of Scoil Éanna in Rathfarnham, and confidently announce to anyone who cared to listen that it was the blood of Patrick Pearse. Maybe one day I would learn to separate fact from fiction and folklore from history. When Henry VIII became ‘King of Ireland’ in 1541 – technically Ireland had been a ‘lordship’ of the English crown since the 12th century Anglo-Norman invasion - Henry’s new title heralded a new commitment to total rule from England. Thus, began the Tudor re-conquest that would end with the defeat of the Irish rebels and their Spanish allies at the Battle of Kinsale in 1601 and the Flight of the Earls in 1607. But no event in history ends cleanly, and this is a tragic example of where a so-called ending was really the beginning of the troubles in Ireland that thankfully have diminished, but have still not gone away. After the ‘flight’ the plantation of Ulster began. This involved dispossessing the native Irish of their lands and giving them to colonists of mainly Scottish and Presbyterian origins, starting a sectarian divide that would last for hundreds of years. By 1600 resistance to the Tudor re-conquest was at a pivotal point. It is ironic that at this juncture, Irish resistance had reached its greatest strength, but was just about to turn on a downward slope to collapse. Almost two hundred and fifty years later, Daniel O’Connell’s monster meetings would reach their pinnacle and yet the Repeal campaign would ignominiously fizzle out. Hugh O’Neill would, in the words of Foster in, Modern Ireland 1600-1972, “meet his nemesis” in Mountjoy, the new Lord Deputy. It could be argued that the Great Famine was O’Connell’s nemesis. But to return to seventeenth century Ireland, the difficult and impenetrable terrain of wood, bog, lake and mountain, mainly unmapped and only familiar to locals, would not be enough to give the Irish the upper hand. Contemporary commentators like Spenser, Moryson, Dymmok, Gernon and Payne recognised the almost insurmountable difficulties posed by the landscape. Furthermore, not only did they distrust the Gaelic chieftains who controlled the west and the north, they also distrusted the ‘Old English.’ These descendants of the Anglo-Norman conquerors who committed the sin of becoming more Irish than the Irish themselves – were regarded from London as being no different to their Gaelic neighbours. The Old English lived mainly in towns and in the Pale. On his march south to Kinsale, O’Neill was supported by the Old English Desmonds. For observers like Moryson and Spenser, disloyalty among the Old English seemed inevitable because many sent their children out to be fostered by Gaelic families, a custom that was still practiced in the 18th century; the infant Daniel O’Connell was fostered out to the Cahills until he was five-years-old. “Lord, how quickly doth that country alter man’s natures,” lamented Spenser. The Old English were in a funny position. In England they were regarded as Irish, but in Ireland most were not recognised as Gaelic. But Old English families like the Barrys and Roches of Cork did become completely Gaelicized. So, what changed things? Religious polarization and relations with the new wave of Tudor settlers would reluctantly drive the rest of the Old English Catholics towards rapprochement with the Gaelic Irish. It was religion that helped to seal the identity of the Old English. Between the sixteenth and seventeenth centuries the Old English moved from a position of simply being English by Irish birth to a coherent group based on one religion. What finally helped crystallize the process, according to Foster, was that after 1603, while the reins of government were returned to local hands – these local hands were Protestant only. Moryson actually travelled around Ireland with Mountjoy and he felt that the Old English rulers had weakened the authority of the Lord Deputy as royal representative. Ever since Henry Vlll, sixty years earlier, regranted land to Irish chieftains on English terms, Irish lords entered in and out of treaties as easily with the English government as with a neighbouring clan. This situation rendered the conquest, in Moryson’s view, as more nominal than real. But things would change dramatically after 1600. The fuzzy demarcation of the Pale would become more defined before moving further west as any colonial frontier worth its salt would. As well as a land grab, it would be a social and cultural grab; now it was all or nothing. Even though O’Neill had modernised Irish warfare to the extent that his soldiers were even using firearms, they did not have the experience to deal with campaigns waged by sieges and forts; a fact that would be clearly demonstrated with the disastrous Spanish intervention at the Battle of Kinsale. It must be remembered that initially, Hugh O’Neill, Earl of Tyrone and Rory O’Donnell, Earl of Tyrconnell were rivals. When they became allies, they posed a real and present danger to Elizabethan England. McCavitt, in The Flight of the Earls, describes the alliance as a “marriage of necessity in the face of growing English power.” Indeed, it was England’s recognition of the power of the Tyrone / Tyrconnell alliance that led, in September 1587, to the kidnapping of the fifteen-year-old Red Hugh O’Donnell and his incarceration in Dublin Castle, fearing as they did his succession to the earldom of Tyrone. But it was not only the English who felt threatened by Red Hugh’s succession to the lordship – family rivalry was also a big factor. In this instance it was his elder half-brother Domhnall who felt he should replace their ailing father as chieftain. Red Hugh’s formidable mother was having none of it and enlisted the support of her Scottish kinsmen. In 1590, at the Battle of Derrylaghan Red Hugh’s army defeated Domhnall and Domhnall was killed. The story of Red Hugh’s eventual successful escape from Dublin Castle has gone into Irish legend and folklore. Several important things happened on Red Hugh’s return. He established his own political ascendancy in Tyrconnell; he sealed his alliance with Hugh O’Neill, Earl of Tyrone, by marrying his daughter Rose; and he helped Hugh O’Neill overthrow his rival Turlough O’Neill. This paved the way for Hugh O’Neill to succeed to the Gaelic title “The O’Neill” in 1595. Lord Deputy Mountjoy showed his disdain for this by breaking the pre-Christian stone at Tullahogue upon which the O’Neills were inaugurated. Notwithstanding, by 1600 O’Neill was being spoken of in Europe as ‘Prince of Ireland’. By now, the English were on a Pinball Wizard mission to topple the Gaelic clans one by one. The MacMahons of Monaghan and the O’Rourkes of Leitrim were targeted, and their chieftains executed. The Maguires of Fermanagh and the O’Donnells of Tyrconnell were next on the list. But Red Hugh’s escape from captivity put a halt to the English gallop. Red Hugh was out for revenge after his incarceration in Dublin Castle, not to mention the near-death experience of his escape. For the first time in a long time English control in Ireland appeared to be on the losing side. McCavitt also suggests that Red Hugh O’Donnell and the Earl of Tyrone may even have toyed with the idea of resurrecting the High Kingship of Ireland on a rotational basis to counteract the growing power of England as an emerging nation state. Indeed, at the height of his powers during the Nine Years War Pope Clement Vlll sent Tyrone a crown of phoenix feathers – proof that these Irish earls were being taken seriously in continental Europe. The three key Irish leaders during this war were Hugh O’Neill Earl of Tyrone and his sons-in-law Red Hugh O’Donnell and Hugh Maguire. Hugh O’Neill particularly angered the English because of his background. From the age of nine he was reared in England in the ‘new religion’, even spending some formative years with the Queen’s favourite, Robert Dudley, Earl of Leicester. He served with the English army in Ireland from 1568 before becoming second Earl of Tyrone in 1587. Indeed, he was granted larger territories than any other Earl in Ireland. That year he also took his seat in the upper house of parliament in Dublin. There is no doubting England’s role in bringing him to power, hence the surprise at his acceptance of the title ‘The O’Neill’. O’Neill and O’Donnell were no shrinking violets, when it came to flaunting their power and exacting tribute from lesser chieftains; a power that strengthened through that age old weapon of intermarriage. By 1600 Elizabeth l was in the last year of her reign. Now a traitorous Elizabethan noble turned restored Ulster chieftain, O’Neill knew that there could be no separate solution for Ulster, so he tried to involve the whole country in his war. He travelled south, exacting hospitality all the way as any High King of old would have done. He had already started native resistance in Munster, Connacht and even the Pale in 1598. Hayes-McCoy in The Tudor Conquest chapter in Moody & Martin’s The Course of Irish History, explains that the English believed that the Irish wanted to take back their ancient land and territories and to return Ireland to Gaelic rule under O’Neill, with the support of the pope and the king of Spain – England’s ecclesiastical and civil enemies. The old Tudor fear was becaming a reality – Elizabeth l’s enemies were using Ireland to injure England. But Hayes-McCoy, Foster and McCavitt all agree that O’Neill would probably have settled for less – non-interference with the Gaelic lords, some powerful positions for Gaelic lords, and freedom for Catholicism. Interestingly, many years later Daniel O’Connell, who was also very good at getting the whole country behind his cause, was not looking for an independent republic; he only wanted a repeal of the Act of Union. Until the Spaniards arrived at the end of 1601, O’Neill and O’Donnell held it together as well as they could – trying to hold off a defeat that would break up their confederacy. Maybe if they prolonged the war until Elizabeth l died, they could negotiate better terms. O’Neill’s greatest victory at the Battle of the Yellow Ford in 1598 made the English more cautious. After this, Mountjoy tried simultaneous attacks on south-west and south-east Ulster – the entries to O’Donnell and O’Neill territory. He multiplied the English garrisons and employed a policy of frightfulness – a slash and burn approach - and used sea power to land behind O’Neill’s back in Derry. When the Spaniards landed disappointingly in Kinsale and not further north as had been hoped, O’Neill and O’Donnell arguably made the mistake of embarking on the impossibly arduous march south to join them. Despite their years of military success, the Irish were unable to fight the kind of formal battle which the English forced upon them. To face the attack from Mountjoy’s forces, the Irish arrayed themselves in the massive formations that the Spanish had used successfully in continental wars. But their inexperience made them slow and to compound the difficulties, their horsemen deserted them. O’Neill, along with his Ulster, Connacht and Munster allies was completely defeated. The Spaniards surrendered the town of Kinsale and in due course Ulster was overrun. The Nine Years War ended with O’Neill’s humiliating submission to Mountjoy in 1603 at the Treaty of Mellifont; Hugh O’Donnell’s brother Rory had already submitted. The defeated rebels were not punished but pardoned. O’Neill was allowed to return to Tyrconnell, but by now he was merely a titular leader. Despite retaining his earldom, he found English rule unacceptable. Interestingly, Daniel O’Connell has been criticised for his disastrous decision to throw in his lot with Whig leader Lord John Russell during the Great Irish Famine. O’Connell did this in the hope of repealing the Act of Union, the source of so many of Ireland’s problems. Did he not understand that he backed a man who was a fully-fledged free trader who insisted that no government intervention be made – even if the result was that millions of Irish would starve because they could not afford to buy the imported corn? Perhaps he did but thought it would be worth it in the long term. Anyway, Russell ignored the repeal campaign and millions suffered. It would seem then, on a closer study of Irish history, that it was not only the Flight of the Earls with its resulting Plantation of Ulster that engendered a strong thread of sectarian division in Ireland. 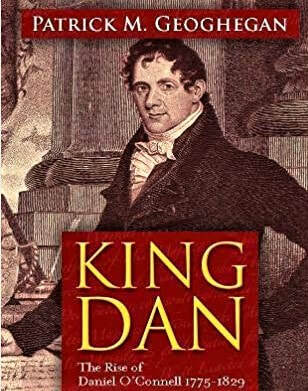 Patrick Geoghegan, in King Dan: The Rise of Daniel O’Connell 1775-1929, reminds us in his introduction that the famous Irish historian, Lecky questioned whether O’Connell’s life was a blessing or a curse for Ireland, especially because many blamed him for polarising Irish society along sectarian lines. And why might anyone say this? Protestants in Ulster sat up and took note of the new, blatantly Catholic force unleashed by O’Connell that coupled religion with nationalism. In their alarm, the Ulster Protestants closed ranks, especially under the banner of the Orange Order. Divisions became deeper, especially between Catholics and Presbyterians who had both suffered under the Penal Laws and joined forces in the United Irishmen and the 1798 Rebellion. The wedge that widened this division was Repeal of the Union, a step too far for Ulster Protestants. The Young Irelanders in particular were not impressed by O’Connell’s use of Catholicism as a weapon to achieve repeal. Daniel O’Connell was cut from the same Gaelic aristocratic cloth as Hugh O’Neill and Hugh O’Donnell. The O’Connell clan had been rulers in Kerry since well before written records began, with the earliest documented mentions going back at least to 1337, when Hugh O’Connell was chief of the ’O’Connell nation’. Just like Hugh O’Neill, O’Connell was sent abroad to be educated, but the motives were entirely different. The young O'Neill was being groomed for a privileged existence within the establishment; a young Catholic like Daniel O'Connell had limited opportunities for a further education in Ireland. At the age of fifteen, he was sent to France, first to the Irish college of St Omer and then to the English college at Douai; but at the height of the Terror he had to flee. He then studied law at Lincoln’s Inn and Gray’s Inn in London. As a young man back in Dublin in 1796, O’Connell was ambivalent about Wolfe Tone’s attempted landing of a French fleet at Bantry Bay, likely influenced by his experience of fleeing the French Terror which made him a pacifist. Notwithstanding his pacifism though, he joined the yeomanry corps for lawyers in 1797, mainly because it might assist his success as an aspiring young barrister. Even though he joined the United Irishmen, the secrecy and the violence convinced him that Ireland’s cause would be better served through constitutional means rather than secret fraternities. Becoming a lawyer just at the outbreak of the 1798 Rebellion, O’Connell was formally called to the bar on the very day that Lord Edward FitzGerald was caught and fatally wounded. Interestingly, O’Connell also became a Freemason, and this brought him into contact with many of the United Irishmen. Apparently, the other members of his lodge included Lord Edward FitzGerald, Robert Emmet and John Philpot Curran. But he would come to reject the secrecy of the Freemasons, a rejection that probably coincided with his return to the Catholic faith, having been quite the Deist throughout his youth; he was expelled from the Freemasons in 1837. O’Connell’s opposition to the Act of Union propelled him into politics, and repealing the Act of Union was even more important for him than Catholic Emancipation. He wanted the Irish parliament restored and he wanted to be an elected member of that parliament, but Emancipation had to happen first, and that notion of Irish Catholics being inferior had to be broken. One public tactic that O’Connell employed to dispel this notion of inferiority was to deny that Ireland had ever been conquered, arguing instead that it had been cheated of its freedom through ‘fraud and treachery,’ and reminding Britain that it had been conquered by the Romans, Saxons and Normans. The riotous build-up to Catholic Emancipation reads like a late eighteenth, early nineteenth century picaresque novel, perhaps something like Joseph Andrews and The Pickwick Papers rolled into one. Unquestionably, a most astounding achievement of galvanising a mass democratic movement without resorting to violence; the only disappointing aspect of winning Emancipation was the disenfranchising of the forty-shilling freeholders, a sacrifice O’Connell was willing to pay. Repeal of the Act of Union though would prove to be beyond the talents of ‘The Liberator’. It must be remembered that Catholics were allowed to sit in the British parliament, and this is where the term Catholic Emancipation is confusing or maybe even misleading. What O’Connell and his supporters objected to, was the oath that new members of parliament were required to take, which stated “that the sacrifice of the mass and the invocation of the Blessed Virgin Mary and other saints as now practiced in the Church of Rome, are impious and idolatrous.” It was this oath that they were trying to overturn. One of O’Connell’s most ingenious brainwaves was to broaden the demographics of the mainly bourgeoisie Catholic Association by introducing a new category of associate member for one penny a month; a modern-day equivalent would be crowd funding on social media. This single act transformed the Catholic Association from an elitist club into a mass movement. Indeed, as Hegarty points out, it was one of the first popular democratic organisations in the modern world. With Catholic Emancipation done and dusted, the monster meetings were resurrected in the fight for Repeal of the Act of Union, and they certainly brought out enough people to worry the authorities. Following on the success of the monster meeting at the Hill of Tara, the authorities became frightened enough to impose a security crackdown. The biggest monster meeting of all, planned for Clontarf, was cancelled by O’Connell, most likely to avoid violence and bloodshed; he was arrested for sedition and imprisoned for three months. While O’Connell was in prison, the British Prime Minister, Sir Robert Peel embarked on an appeasement programme for O’Connell’s followers, in the hope of causing disunity in the ranks over Repeal of the Union. Sweeteners included an annual grant to Maynooth seminary, which the Church accepted but many Catholics opposed; and the foundation of the non-religious Queens Colleges in Cork, Galway and Belfast, which many Catholics welcomed, but which was opposed by most of the hierarchy and O’Connell. The Battle of Kinsale marked the downfall of the last of the Gaelic chieftains and the end of the old Gaelic world. The Treaty of Mellifont signalled the end of Gaelic Ireland and the start of English rule in the north that continues to the present day. Ireland was conquered. With the disappearance of the Gaelic aristocracy, the stage was set for the plantation of Ulster, whereby Protestant settlers from England and Scotland were granted land, sowing the seeds of today's divided island of Ireland. Both the Flight of the Earls, which resulted in the Plantation of Ulster, and Daniel O’Connell’s harnessing of Catholicism for political gain, which resulted in Ulster Protestants circling the wagons, can be cited as some of the deep, background causes of a sectarian divide in Ireland.